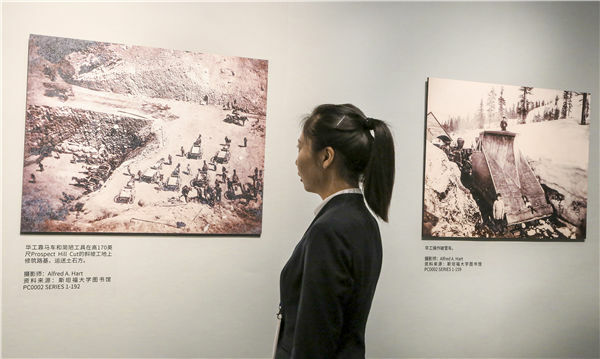 A visitor looks at a photo of Chinese railway workers in America 150 years ago at an exhibition in Beijing in September 2017. An oil painting depicting three Chinese workers in Qing Dynasty (1644-1911) clothing and hairstyles, and working on a rocky cliff attracted Martha Davis' attention at a recent exhibition. Davis, who lives in the San Francisco Bay Area, and her friend lingered in front of the painting. "It (the painting) brings out the spirit of those workers," says Davis. The exhibition, The Backbone of the Sleeper, was organized by the Chinese Historical and Cultural Project, a nonprofit group that aims to promote, educate and preserve Chinese-American history and culture in Santa Clara County in the US state of California. The exhibition has assembled 25 oil and traditional Chinese paintings created by Chinese and local artists. It runs through the end of this month at a library in Milpitas, California. Some of the paintings show the splendor of the landscape along the Transcontinental Railroad, while others depict the scenes of Chinese laborers at work, such as cutting stone while hanging out over cliffs, or dragging equipment into caves. The first US transcontinental railroad was completed on May 10, 1869, linking the West and East coasts for the first time in American history. The construction, which took six years and stretched for nearly 3,219 kilometers, was one of the most remarkable engineering feats of the 19th century. Chinese laborers made up the majority of the workforce hired by the Central Pacific Railroad Co to build the railroad. However, their role remained neglected for years. The mission of the exhibition is to record the efforts and contribution the Chinese workers made to the first US transcontinental railroad and the country's economy 150 years ago through the work of contemporary artists, says Huang Wei, president of the American Contemporary Chinese Painting Research Association. The association organized a trip for Chinese and US artists to revisit sections of the railroad last year, including some of the toughest terrains, to experience the lives of the Chinese workers. This exhibition is the first show of their artworks this year. It will travel to San Francisco, Los Angeles and the US state of Utah. To celebrate the 150th anniversary of the completion of the transcontinental railroad in 2019, the California assembly passed a resolution in 2017 to recognize and honor the Chinese railroad workers by designating May 10, 2017, and every May 10 thereafter, as California Chinese Railroad Workers Memorial Day. Nearly 1,200 Chinese railroad workers died from work accidents, avalanches and explosions while working in the Sierra Nevada Mountains, the resolution says. Despite the dangerous conditions and prejudice they faced, the Chinese workers, through their fight against discrimination, "set an example for the millions of Asian-Americans who came to the United States after them," it adds. At the Milpitas Library, an ongoing photo exhibition, which was also organized by the Chinese Historical and Cultural Project, tells the history of early Chinese immigrants, the Chinese community's development and their achievements in various areas. Following these exhibitions, the organization will exhibit works showing the achievements in aviation and cultural exchanges between China and the US, according to David Yick, co-president of Chinese Historical and Cultural Project.